There is a Jane Austen-esque phrase in my book: “it is a ceaseless wonder that our universal and objective science comes out of human – sometimes all too human – enquiry”. Physics is rather hard to blog, so I’ll write instead about the practitioners of science – what are they like? Are there certain personality types that do science? Does the science from different countries end up being different? Without question there are fewer women physicists than men physicists and, also without question, this is a result of both nature and nurture. Does it really matter how much of the ‘blame’ should be apportioned to nature and how much to nurture? Societies have evolved the way they have for a reason, and they have evolved to have less women pursuing science than men (at present). Perhaps ‘intelligence’ has even been defined in terms of what men are good at? Do a disproportionate number of physicists suffer from Asperger Syndrome (AS)? I deplore the fashion for retrospectively diagnosing the most famous physicists, such as Newton and Einstein, as suffering in this way. However, I’ll jump on the bandwagon and offer my own diagnosis: these two had a different ‘syndrome’ – they were geniuses, period. Contrary to common supposition, it would not be an asset for a scientist to have AS. Being single-minded and having an eye for detail – good, but having a narrow focus of interest and missing too much of the rich tapestry of social and worldly interactions – not good, and less likely to lead to great heights of creativity. In the late 18th and early 19th centuries, the science of energy was concentrated in two nations, England and France. The respective scientists had different characteristics. In England (strictly, Britain) the scientists were made up from an undue number of lone eccentrics, such as the rich Gentleman-scientists, carrying out researches in their own, privately–funded laboratories (e.g. Brook Taylor, Erasmus Darwin, Henry Cavendish and James Joule) and also religious non-conformists, of average or modest financial means (e.g. Newton, Dalton, Priestley and Faraday). This contrasts with France, where, post-revolution, the scientist was a salaried professional and worked on applied problems in the new state institutions (e.g. the French Institute and the École Polytechnique). The quality and number of names concentrated into one short period and one place (Paris), particularly in applied mathematics, has never been equalled: Lagrange, Laplace, Legendre, Lavoisier and Lamarck, – and these are only the L’s. As the historian of science, Henry Guerlac, remarked, science wasn’t merely a product of the French Revolution, it was the chief cultural expression of it. There was another difference between the English and French scientists, as sloganized by the science historian Charles Gillispie: “the French…formulate things, and the English do them.” For example, Lavoisier developed a system of chemistry, including a new nomenclature, while James Watt designed and built the steam engine. From the mid-19th century onwards German science took a more leading role and especially noteworthy was the rise of new universities and technical institutes. While many German scientists had religious affiliations (for example Clausius was a Lutheran), their science was neutral with regards to religion, and this was different to the trend in Britain. For example, Thomson (later Lord Kelvin) talked of the Earth “waxing old” and other quotes from the Bible, and, although he was not explicit, appears to have had religious objections to Darwin’s Theory of Evolution (at any rate, he wanted his ‘age of the Earth calculations’ to contradict Darwin’s Theory). Whereas personal, cultural, social, economic and political factors will undoubtedly influence the course of science, the ultimate laws must be free of all such associations. Presumably the laws of Thermodynamics would still be true, and still have been discovered, eventually, even if the steam engine had never been invented. Some of the deepest and most beautiful aspects of science concern the very safeguards introduced in order to ensure objectivity. One such is Einstein’s Principle of Relativity, which asserts that the laws of physics must be the same for all (valid) observers, regardless of their position, direction, time or state of motion. This is far less ambitious than, say, Postmodern Relativism, but it is more precise and more achievable. Science is humble and pragmatic but it provides the only method of arriving at a universal knowledge. 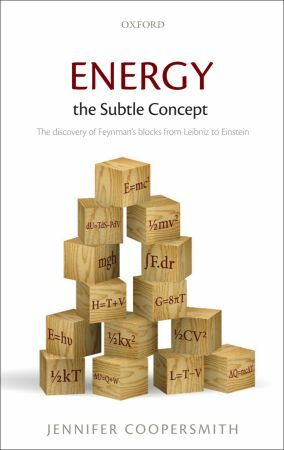 Jennifer Coopersmith is the author of Energy, the Subtle Concept: The discovery of Feynman’s blocks from Leibniz to Einstein. She is Honorary Research Associate in the Department of Civil Engineering and Physical Sciences at La Trobe University, Australia. I would like to congratulate you on your book, even though I have read only the reviews so far. I have been working along a similar line, trying to explain the role that classical thermodynamics could – and should – play in efforts to use primary energy resources more efficiently. As you can imagine, if most of the scientific world needs to learn that energy is a subtle concept, then the same people need to learn a lot more about the nature of intellectual constructs such as “Available Energy” which represent the things we call primary energy resources. I have been drafting a monograph on that subject for a little more than 2 1/2 years now, with manuscripts going back and forth between me, George Hatsapoulos (My former teacher and colleague at MIT0, David Schoonmaker (Editor in Chief, American Scientist), and Ambassador Richard Jones (Deputy Executive Director, International Energy Agency, Paris). It has taken me so long to get this manuscript in shape because I have tried to give a fairly complete story of the historical origins of thermodynamics, from the early 17th century through the early 20th century. There were, as you know, many twists and turns in that story, and I think it is well to bring them out to elucidate the subject that avoids the many false reifications that plague public understanding of energy and efficiency: i. e., energy is a mental construct, not a physical thing.